People often ask why I stopped making weekly Walking Dead comparisons to the comic source material. There were practical reasons, along with the fact that numerous outlets (including The Walking Dead’s own website) took up the same practice, but the truth is that The Walking Dead stopped interacting with its comic roots in an interesting way. 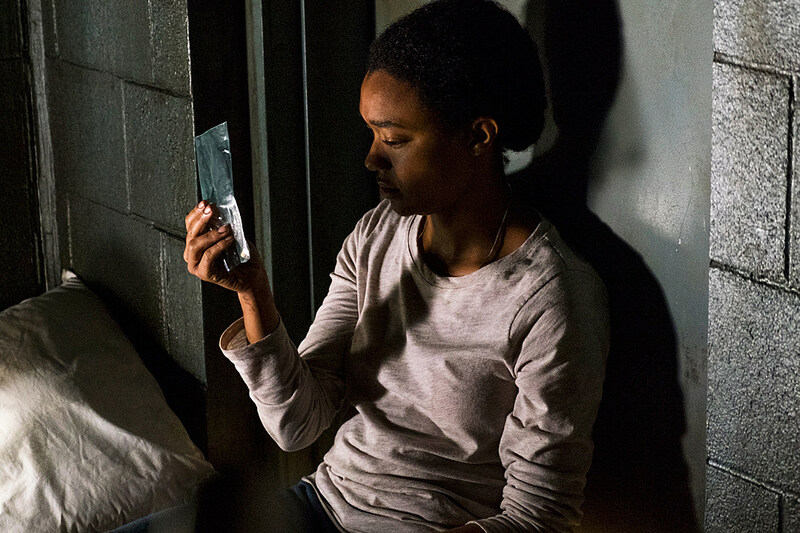 Unlike Game of Thrones’ adaptation, The Walking Dead tends to reenact its source material word-for-word, to a point that while Sonequa Martin-Green’s Star Trek: Discovery role spelled a likely exit, reenacting Holly’s comic capture beat-for-beat guaranteed she’d turn up dead in the exchange with Alexandria. To be fair, the Season 7 finale, “The First Day of the Rest of Your Life,” didn’t exactly hide that, between the opening montage reiterating Eugene’s poison pill, or those awkward bumpers of Sasha’s Abraham flashback telegraphing some significance to her isolation in that casket*. Still, there’s a notable dichotomy between treating that reveal as a moment of surprise, and having Jadis and the junkyard folks’ betrayal actually catch viewers off-guard. The outbreak of war itself isn’t any major shock, nor is the lack of any notable casualties, but a non-comic element like Jadis felt like the one true wild card in an otherwise predictable showdown. *I suspect placing Sasha in a casket (as opposed to the comic’s bag over Holly’s head) owes to Fear The Walking Dead borrowing the same stunt for its second season. Still, that was about concealing an accidental death, while the comic version was an intentional ploy on Negan’s part, so I’m not sure what Sasha thought her undead corpse might accomplish by springing out in a tense exchange. Don’t get me wrong, this was the most exciting The Walking Dead has been all season, and it didn’t take the sudden appearance of a mauling tiger to get there. The Walking Dead has a world of work ahead of itself to figure out what prolonged war between Negan and Rick actually looks like, but “The First Day of the Rest of Your Life” at least felt like the catharsis the writers have been building toward all season. There was plenty of payoff, and some notable parallels with the premiere, including Rick and Carl again kneeling at Negan’s mercy; it just took us far too long to get there. As I mentioned last week, the decision to save any actual conflict for the finale guaranteed an exceptionally busy finish, to the point that a number of significant arcs felt glossed over. Dwight’s defection ultimately amounted to nothing in the confusion, while both Morgan and Carol served primarily as a rescuing cavalry, above any meaningful resolution to the isolation (or in Morgan’s case, insanity) the pair threaded all season. 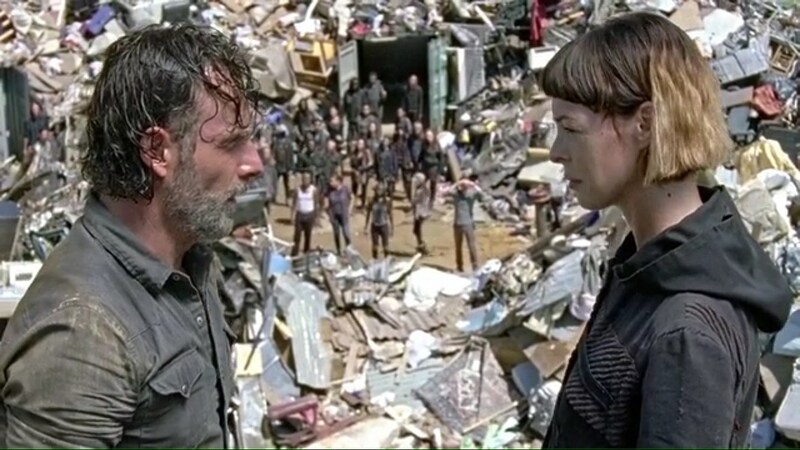 And as much as Jadis’ interaction with Negan reiterates the amusing distinction* her group provides, the “Heapsters” heel-turn does mean we spent two or three episodes building these characters up as allies, only to have them turn with little explanation, and essentially guarantee their role as enemies next season. *Jadis’ proposition to “lay with” Rick offered another wonderful moment of weirdness for this oddly monosyllabic group, but why even bother, given what she knew of how the exchange would go down? Michonne already fits pretty well between them, just saying. It’s a strong finish to an otherwise uneven season that already alienated many viewers with its premiere, and I appreciate the level of artistry on display in smaller moments like the callback to Sasha and Maggie watching the sunset, or that closing montage. The Walking Dead could use more episodes operating on this frequency, and I suspect there’s lessons to be learned here. There’s no need to follow the comic book source material with such telegraphing reverence, and perhaps AMC might consider backing down from a bloated 16-episode order as well (lord knows the CG deer budget could use it). So you’ll have to forgive me, if one notably strong finale doesn’t inspire a tremendous amount of confidence for next season, or its 100th episode premiere. At least we don’t have to languish in another awful cliffhanger, right? I find it hard to believe that Daryl would resist killing Dwight, especially given Tara’s urging. Again, it is downright reasonable how many lives Negan has taken from Rick, given the dozens of Saviors his group has killed. The name “Heapsters” wasn’t enough; they had to actually ride bicycles. And how exactly did they keep up with those trucks?! I’m admittedly disappointed that Negan bested Jadis in negotiations. He didn’t earn that win. The Walking Dead is reaching Hot Tub Time Machine-levels of trolling Rick’s hand. Come on, Negan needed some defeat. Odd though it was that his truck managed to escape (shoot the tires! ), he should have at least lost the middle-finger he so gleefully stuck out. Is it me, or was Lauren Cohan’s eye-shadow especially prevalent in that last scene with Sasha? Was that war paint, or just unusual lighting for the normally-minimalist makeup? Eric may have survived, but we are totally shipping Aaron and Jerry. The Walking Dead will return for Season 8 in October, airing at 9:00 P.M. on AMC.